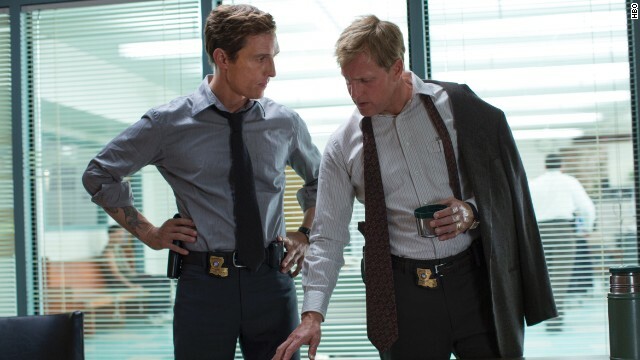 'True Detective': What's the verdict? It's hard to go wrong when your new show includes both Matthew McConaughey and Woody Harrelson, so HBO's "True Detective" was already off to a good start when it premiered on Sunday night. The new crime drama is set in Louisiana across two time periods as detectives Rust Cohle (McConaughey) and Martin Hart (Harrelson) recount a years-long search for a serial killer. McConaughey hasn't done a lot of TV work outside of "Eastbound & Down" appearances and a voiceover job, while Harrelson is returning to a small screen series for the first time since "Will & Grace." Neither McConaughey nor Harrelson are lightweights - in fact, while "True Detective" was having its bow, McConaughey was winning the best dramatic movie actor award at the Golden Globes - and they both prove it with this new series. McConaughey in particular, says The Huffington Post's Maureen Ryan, "has spent much of the last decade proving he's one of the best actors of his generation, appearing in a series of films that have allowed him to show his impressive range. McConaughey brings every bit of that skill, confidence and undeniable charisma to 'True Detective.'" HitFix's Alan Sepinwall is already predicting that McConaughey will land every award tossed his way, "both because he is a Movie Star stooping to work in television, and because he is jaw-droppingly great. Even if nothing else about 'True Detective' worked — and so much of it works spectacularly — McConaughey would be worth the price of admission." To Sepinwall, "True Detective" is less about the serial killer as it is the detectives that McConaughey and Harrelson embody, and embody well. While critics raved about McConaughey's performance, it wasn't because Harrelson's isn't as strong but rather because his part doesn't allow for the tricks McConaughey can pull with his. "Harrelson and McConaughey are both at their best," says Variety. "Given the number of eccentrics the former has played, it’s also interesting to think about how the show would look if the roles were reversed, since either guy would be almost equally well suited to the other’s part." The top-form acting is supported by "series creator and novelist Nic Pizzolatto, (who) undulates from effectively brash soliloquies to penetratingly nuanced moments carried by sparse prose," and from "director Cary Fukunaga has created a beautiful, sprawling sense of place," The Hollywood Reporter said in its review. Pizzolatto and Fukunaga were there for each of the anthology series' eight episodes, giving "True Detective" a continuity in tone and voice that has been praised as progressive. Should this series get picked up for additional seasons, it would return with a new case and new faces. But, if viewers feel similarly to Grantland's Andy Greenwald, we may not get that far. Although Greenwald appreciated the series' form "as truly radical and forward-thinking," in his eyes "the content is anything but. ... Perhaps you aren't yet exhausted, as I am, by American television's endless fascination with the tormented psyche of white men and/or serial killers. If so, you might be able to demonstrate more patience with True Detective than I've been able to muster." Did you catch Sunday night's premiere episode? What did you think? Dark, brooding & fascinating and- as expected beautifully acted by both stars & supports -my one complaint is a directorial matter- with Episode One anyway. It was ALL one pace –every scene –once its mood was established -it followed with same speed of dialogue, same speed of actors thought process & delivery, same momentum of action- -We got your initial setting & mood folks– established at once–now we need a more varied pace-something they remembered to do -brilliantly-on Breaking Bad. .
incredible. reminds me of the quallity of the first season of the sopranos. mcconaughy and harrelson are great. Love the show. very interesting. is the next episode next Sunday? I really liked everything about it but the plot, which kind of makes it a pointless exercise.I admit it sounds a little bizarre, but i have to say it: Oh lord, not another serial killer! Given the build-up, I was expecting more. I will probably watch a couple more times but I felt that the show was slow-moving, disappointed. I loved it. I give it an A+. Riveting , beautiful, dark and forboding. I canot say enough good things about this show. The writing is spectacular! The attention to detail is like no other show I have seen. It is so beautifuly shot with scenes that speak louder than any words leaving you uneasy waiting for more. Harrelson and McConnaughy are incredible, this pair up plus everything else that makes up this show will take it further than any other series...ever. BRAVO! AMAZING. Watching again for the second time. Cant wait to see what unfolds. Liked it so much you had to say it twice. AMAZING. Watching it again for the second time. Cant wait to see what unfolds. Dull and dreary. I understand the idea, it didn't work last night. I'll give it another episode or two. I loved it. Tense, tight drama with tones of McConaiughey's disturbed monologue in Frailty... His gaunt look also is riveting... like Christian Bale and a few exclusive others, McConaughey shows a dedication to the persona of his role. Hope it continues. I was surprised at first being that two big shot actors where going to be part of a new series. I watched it and I really liked it but it leaves you needing/wanting more so that you fully understand what is going on and just to see the conclusions. I hope it stays on! Matthew looks a little thin to me...will give the show a look. I was just wondering if he's had anything to eat since then. Jared Leto gained some of the list weight back.